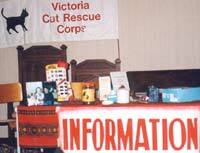 The Victoria Cat Rescue Corps is primarily a spay and neuter organization. Our goal is to reduce suffering by reducing the number of stray, feral, and unwanted cats through spaying and neutering. We also offer financial assistance to low income pet owners towards the veterinary costs for spaying and neutering. Pledges of $50 for a spay, $35 for a neuter are made a participating veterinarian, who deducts these amounts from the clients costs. These participating veterinarians usually offer a reduced spay/neuter fee as well. We also feature a spay/neuter Blitz during "kitten season" in the Spring of each year, offering cat spay and neuter at no cost to low income owners. Clients can access the above program by calling (250) 656-1100. This program is ongoing, but dependent on funds available. Some conditions and limitations apply. Please note: Our adoption/foster program is currently at full capacity. We are also unable to provide short-term foster homes for domesticated cats. Published two or three times each year, our newsletter is focused on keeping our members updated on our activities, and recruiting new members and volunteers. Interesting articles, membership information, and upcoming events are included. A subscription to this newsletter is included in society membership. 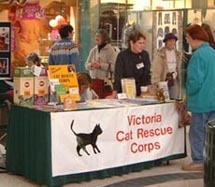 In the year 2000, The Victoria Cat Rescue Corps launched a project to help animals in other communities. Animal lovers in Quesnel BC are frustrated by the stray and abandoned population there, and by the high cost of medical care. 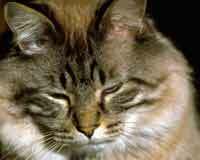 We spent $1,200.00 on a special outreach project to spay and neuter cats in the Quesnel area. This Project was dedicated to the memory of our founders, Thora and Tom Bonneau. When volunteers are available, we take our message for responsible pet ownership out to the public by being visible in Malls or stores several times a year. We have in the past been invited to be present at Cat shows and Pet Health Symposiums throughout the city. Our programs range from financial assistance for local low income pet owners, to community education and outreach. We are able to do so much in the community, because of the donations and help we receive from our supporters. If you would like to help, please call us at 250-656-1100 or email to meow.133@victoriacatrescue.com. We would like to see pet owners spaying and neutering their cats. We understand that spay, neuter and other veterinary care can be prohibitively expensive for some cat owners, so we offer assistance to those in need in the community. We always welcome new volunteers, and we always need temporary foster homes for homeless cats. 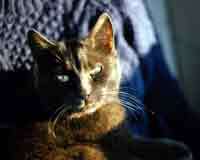 If you would like to help, please visit our How to help section, call (250) 656-1100 or meow.133@victoriacatrescue.com. Our membership comes with a subscription to our newsletter, The Scratching Post. 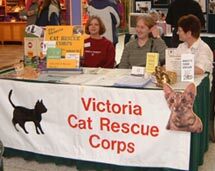 For $30 (individuals) or $45 (for families) you can get a one-year membership in the Victoria Cat Rescue Corps Society. Seniors, students, and the un-waged pay $15. For a single payment of $150, you can become a lifetime member. 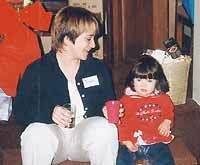 Our Millennium Outreach Project was launched in 2000 in honour of our founders, Thora and Tom Bonneau. To learn more about them, and the history of our organization, click here. We encourage the public to attend our events! We have a great time, and it's a wonderful way to support our fundraising efforts. Let's make sure that all of the cats that are born have homes and are wanted!